Out of the fire and into the omelet pan. Allen Yuen deals well with hungry crowds. In New York, he managed Mission Chinese Food, a red-hot restaurant that calmed the waiting masses with a free beer keg and serve-yourself plastic cups during its early weeks. Mission even occasionally passed out free snacks. Mostly, though, guests would put their names on the waiting list and hit a nearby bar to have a few drinks because they knew they weren’t eating dinner for a while. Now Yuen’s managing Petit Trois, chef Ludo Lefebvre’s no-reservations bistro where there are only 22 seats and everyone dines at the kitchen-facing bar or at a counter. How is Yuen handling a popular restaurant that seats half as many people as the place he opened in New York? 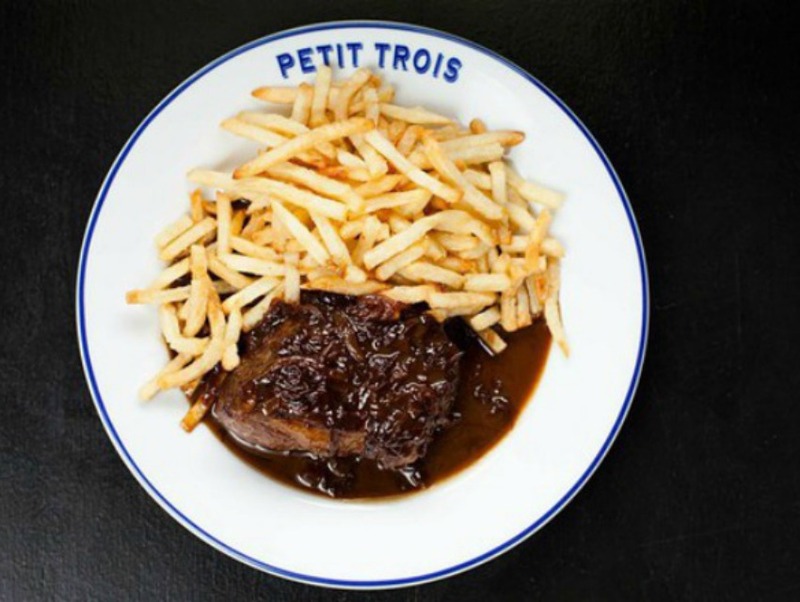 We spoke to Yuen, whom you’ll see at Petit Trois most nights (and days), about this balancing act, the best time to pop by for some steak frites, and some ways that L.A. is different from New York. Los Angeles magazine: You opened and managed New York’s Mission Chinese, where waiting more than an hour to sit down wasn’t uncommon. How does having that experience help you deal with the crowds at Petit Trois? How are things different in L.A.? Allen Yuen: In general, New Yorkers are willing to wait longer for a table. My theory is that New Yorkers don’t mind waiting longer since they can go to a bar and drink all night until their table is ready. People in Los Angeles have to drive home, so they’re not going to drink five cocktails, eat, and then get behind the wheel. On the plus side, I don’t deal with many people that come to the restaurant completely wasted. What are some of the craziest things people have said to you to try to get a table at Mission or Petit Trois? I haven’t really encountered anything too crazy, but I will say that when I was at Mission Chinese, there was a woman whose baby was sleeping in a stroller and I told her that she couldn’t take the stroller back into the dining room since space was really tight. She didn’t want to wake her child, and was so desperate to eat, she attempted to leave her baby with me in the stroller while she went and ate. Luckily, the baby woke up, and she decided to take her out of the stroller and into the restaurant. It’s 7 p.m. on a Friday at Petit Trois. What’s the wait like? When are the best times to come? The wait is usually about 35 minutes, sometimes it could be longer depending on how large your party is. The best time to come is when we open at 12 p.m. or between 3 p.m.-6 p.m. if you don’t want to wait. We serve the full menu all day. Petit Trois is one of the few good restaurants in L.A. that serves late-night. What’s the room look like at 10 p.m.? Very lively. The dinner rush is over, it’s a great time to talk to guests and see how they liked their meal. Chef Ludo is also around to talk with new diners and our regulars. What’s your favorite thing to eat at Petit Trois? The omelet is my favorite by far. I learned to make it on my own, so I can eat it on my days off as well. What are some of your other favorite L.A. restaurants? The ethnic food is amazing out here, so I love exploring the San Gabriel Valley for Chinese restaurants. Nothing beats a home-cooked meal with my fiancé though. Tell me about your comics. 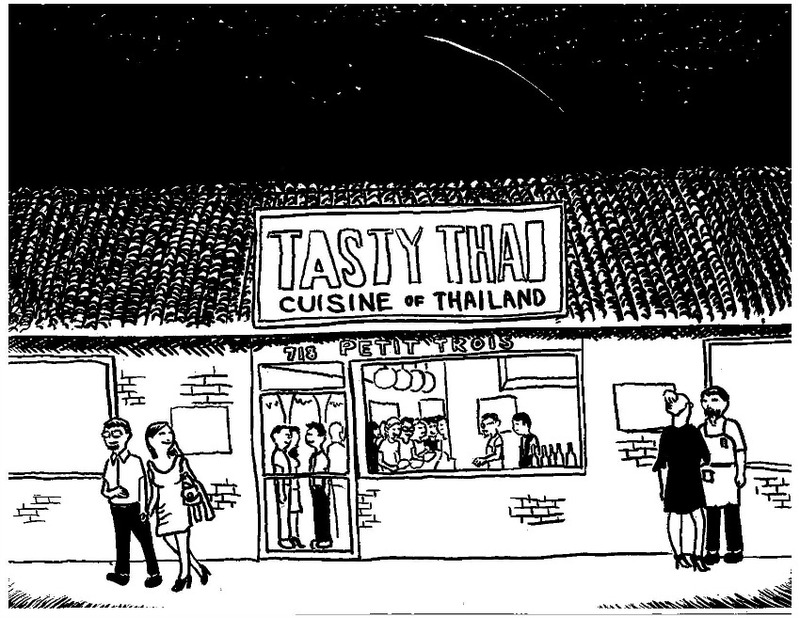 Do you plan on making comics about your L.A. restaurant adventures? My comics are autobiographical, and I will eventually draw some about L.A.
How do you think the L.A. food scene compares to New York? For me, the Chinese food is better in L.A., but I miss pizza in New York.